The Space Age hasn’t lived up to expectations. If 2001: A Space Odyssey is anything to go by, we should have been flying regularly to the moon 15 years ago. In reality, the last time we visited our lone natural satellite, the first video game console had just come out. Today, we may have an impressive array of video games, but we’ve done little to expand our frontiers in outer space. Human presence has been limited to low Earth orbit — the International Space Station is only 400km above us. The NASA Space Shuttle program came to an end in 2011, and NASA’s plans to return to the moon by 2020 have been scrapped. Instead, efforts in the last couple of decades have shifted to unmanned spaceflight, planetary rovers and probe flybys. Robots have left their wheel prints on Mars, snapped close-ups of Pluto and even landed on a comet. So will an Earthling ever obtain Martian citizenship? Or will we remain earthbound, living out our interstellar wanderlust via robotic proxy? Without the geopolitical and economic rivalries of the Cold War, there’s little incentive to shoulder the substantial cost of human spaceflight. Sending humans into space is tricky and expensive. We need food, water and oxygen. We don’t like the extreme temperatures and high energy radiation of outer space, and our bodies turn to mush after a while in low gravity. There’re a few reasons for this. For one, humans are more mobile. It took eight years for the Mars Exploration Rover Opportunity to traverse the same distance that the Apollo 17 astronauts covered in just three days (around 35 km). “Human explorers on Mars would be able to accomplish far more science than our current rovers … more in a couple weeks than what our rovers have accomplished in a couple of decades,” noted Chris Carberry, CEO of Explore Mars, Inc.
Robots aren’t the only ones who can collect geological samples. Humans have the advantage in that they need to return to Earth — which means they are able to bring these samples back with them. Robots, on the other hand, tend to go on one-way trips. The six Apollo missions brought back a total of 382kg of lunar material, and studying it has revealed important clues about early planetary formation in our solar system. Even if robotic missions do come back laden with rocks and soil, their samples are greatly diminished in both quantity and diversity. The impressive sample return capacity of the Apollo missions has spawned a significant legacy: more than 2,000 scientific papers and counting. In contrast, the Mars exploration robotic missions have only generated around 400 publications to date. Clearly, there are pros and cons for both human and robotic space exploration. But is it really as simple as an either-or choice? Not at all. Framing the debate as ‘robots vs humans’ creates a false dichotomy. In reality, the two are complementary and synergistic. Indeed, robots open new frontiers to humans. They’re extensions of ourselves; our eyes and ears, our surrogates. The Apollo missions would have been impossible were it not for the robots that boldly went where no man had gone before. The Ranger program produced the first American spacecraft to transmit close-up images of the moon’s surface and ‘land’ on the moon (essentially a crash impact). It honed NASA’s navigational skills and laid the groundwork for Apollo. Then, the Lunar Orbiter mapped the surface of the moon and scoped out potential landing sites. The Surveyor program saw five spacecraft successfully complete “soft landings” on the moon, thereby solving several critical space engineering challenges. These early probes established that moon dust was actually firm ground — thus giving Neil Armstrong the green light to take his one small step. In the future, people may not be landing in this boots-on-the-ground sense at all, thanks to the idea of telepresence. Telepresence combines several technologies to allow a person to interact (see, hear, touch) in near-real time with a remote environment. We already use telepresence successfully on Earth: from telesurgery with doctor-robots controlled from thousands of kilometres away, to exploration of deep-sea environments with remotely-operated vehicles. But if we tried to deploy this technology in space, we’d run into a problem: latency. It takes 2.6 seconds to send and receive Earth-moon signals because our communication is limited by the speed of light. To give you an idea of how limiting this can be, astronauts tested telerobotically tying a shoelace with 2.6 seconds latency. It took ten minutes. Without this delay, the shoelace was tied in just one minute. For Mars, two-way latency is between eight and 40 minutes, depending on orbital location. So, if we want to be telepresent, we need to be sufficiently nearby that the perceived lag is negligible. Hand-eye reaction time —about 200ms — is considered satisfactory. This means we’d need to be within 30,000km for telepresence to work. The solution? Send spacefaring humans close enough, then dispatch robots to do the dirty surface work. This has several advantages over the classical human exploration model. Most of the cost, difficulty and danger of human spaceflight is associated with entering and exiting the deep “gravity well” of a planet. If you could station astronauts in an orbiting habitat close enough to the desired exploratory target, without actually going all the way down there, it would be significantly cheaper and safer. Astronauts could then remotely operate robots on the surface, almost like an astro-avatar. This style of exploration opens up a vast array of potential new destinations. Imagine strolling through Venus’ sizzling desert scape, or examining the cryovolcanoes on Titan — all while remaining safe and comfortable in a nearby orbiting ship. Telepresence may also be the only way we can accurately answer the foremost Martian question: does the Red Planet harbour life? Because, to answer this question accurately, we must be careful not to introduce Earth microbes to Martian environments. A rover can be decontaminated, whereas sterilisation of one human with their billions of resident bacteria is not feasible. So we’d definitely need robots to explore the watery, potentially-life-harbouring parts of Mars. According to Harley Thronson: “In the long term, I see robots taking over more of the role in space exploration that today is thought to be purely the province of humans.” But what will these intrepid robo-explorers look like? Will we have R2D2 à la Star Wars or TARS from Interstellar? Well, we may not be at sci-fi levels yet, but advances here on Earth foreshadow an increasingly robotic future. 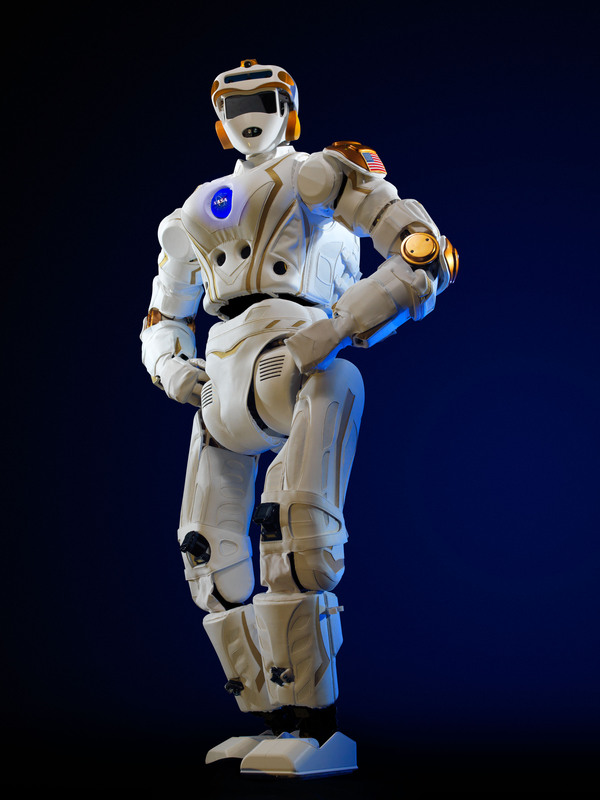 In the works is NASA’s six-foot-tall humanoid robot, designed to work alongside human astronauts on the long journey to Mars. An earlier iteration, R2, currently calls the ISS home. He can be controlled from the ground, teleoperated by astronauts onboard or complete some basic tasks autonomously. Meanwhile, work continues on the latest iteration, named R5 or Valkyrie. NASA has recently announced a Space Robotics Challenge, with the aim of increasing the robot’s dexterity in preparation for his big Martian odyssey. Each team’s R5 will be put to the test in a virtual Martian dust storm. They’ll have to repair a solar array, fix a habitat leak and align a communications dish. The winning team will receive a $1 million prize. Sound familiar? The idea of exploration by telepresence, or by robotic proxy, unearths a deeper question: what does it mean to be an explorer? In the past, explorers have traversed vast oceans like Christopher Columbus, or summited lofty peaks like Sir Ed Hillary and Tenzing Norgay. Neil Armstrong and the Apollo astronauts mimicked this heroic, physical exploration in outer space. But with our newfound technological capabilities, will our perspective expand? Will we be satisfied with an indirect experience — only going most, but not all the way there? Some assert that the very future of humanity depends on us learning how to live in space. “In the very, very long-term, I believe that humans probably will have to leave the Earth and settle other locations in the Solar System. And perhaps beyond,” said Harley Thronson. But in order to achieve these lofty spacefaring aspirations, we have to keep making incremental steps into the final frontier. Humanity needs to overcome the inertia that’s dragging our liftoff into the Space Age and embark on our next giant leaps into the extraterrestrial future. It’s difficult to say exactly what this future will look like. But my guess is that humans won’t relinquish all exploratory roles to robots. Our insatiable curiosity will keep us forever wondering: What lies behind that Martian mountain? What dwells at the bottom of Titan’s methane oceans? Can we get there?